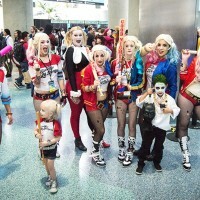 The sixth annual LA Comic-Con was held this past weekend at the Los Angeles Convention Center. We were on hand to enjoy the festivities. And, just in time for Halloween, we've assembled a collection of our favorite LA Comic-Con cosplayers. Joel Murphy talks about his time as an extra on Don't Think Twice and how the film mirrors his own improv experiences. Our editor-in-chief Joel Murphy is an extra in season four of House of Cards. We share a few screenshots of him hanging out in the background of episodes eight and nine.